The double-sided blanket printing means double the fun and double the chance to show off your unique designs. Two layers of 285gsm polar fleece are hand stitched together, creating a super thick and snug blanket to cuddle up to. Be creative and print contrasting designs on each side, giving you essentially two blankets in one, or for a personal touch, write a message on the reverse to surprise your recipient. Get two blankets in one with double sided blanket printing, a stunning way to show off your photos and designs. Made from double thick fleece, this double-sided blanket is a gorgeous gift for loved ones, letting them wrap themselves up in happy memories. The print is long-lasting and won't crack or peel, preserving your photos for a lifetime. Choose from four sizes in landscape or portrait and enjoy the feeling as you cuddle up against the sumptuous, warm fleece, printed on both sides with your designs. Really good quality print at a great price. Excellent quality and quick and easy to make. Arrived very quickly. Blanket is great quality. The photos are very clear and the product arrived very quickly. Really pleased with my purchase. Care: Your double sided fleecy blanket is extremely soft but also very hardwearing. It can be washed time and time again without the print fading or deteriorating in quality. Machine wash at 30°c and leave to dry naturally. You can tumble dry but do so on a low heat only. Do not wring out. Design three blankets for the price of two and treat your friends and family to a bespoke gift. Each one can be designed individually to feature different photos, just make sure there are three blankets in your basket and the discount will automatically be applied. Two layers of printed 285 gsm fleece are handstitched together to create an incredibly thick and warming blanket. Handmade to order in our London studios, the finish is sublime with a high definition photo print reproduction and flawless stitching details. The specialist printing process creates a bond between the ink and fabric fibres, so you can rest assured your designs won't peel away or scratch off. Please note: As everything we provide is handmade to order, all sizes may have a slight variance. Printing on both sides of your blanket is a savvy way to get two blankets in one. Each side can feature a completely different colour scheme, concept or photo, allowing you to instantly change the dynamic of a room. You could design one side in monochrome and the other in vibrant colour as a way to enjoy both artistic effects. Alternatively, you can simply use the extra space to print more of your treasured photos. A nostalgic gift, this is a brilliant way to reminisce and share forgotten stories. These blankets are extremely popular for those living with Alzheimer's / Dementia. To help with memory recall, you could print pictures of family members on one side including their names, and pictures of their favourite places on the back. This gives you all a great opportunity to instigate conversations and retell stories. 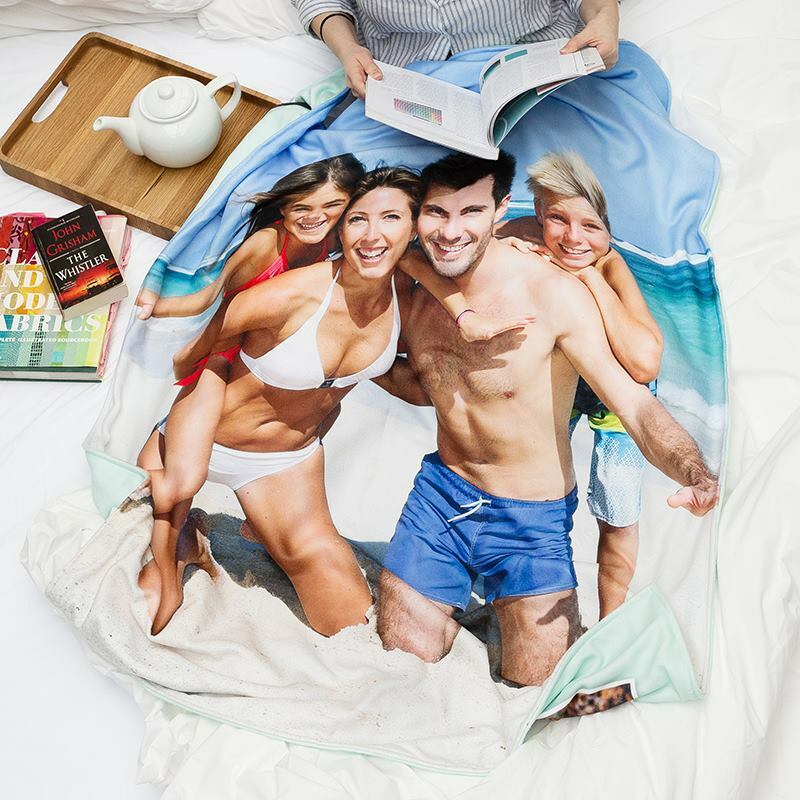 For an alternative way to propose to your loved one, you could surprise them with a blanket that features a heart photo collage on the front and the all-important question on the back. Leave it to them to discover the question and watch as their face lights up. Interior design enthusiasts will love a double-sided blanket that lets them decorate several rooms with one furnishing. Whatever their style is, you can upload two very distinctive designs on the front and perfect, perfect for switching things up in an instant.